On the Monthly charts – Trend is up and one timeframing for the last 5 trading months. Weekly timeframe is balancing for the last three months . And on the daily charts Bank nifty futures is in short term balancing mode and looks structurally weak due to the nature of consecutive overlapping consolidation phases as shown below. 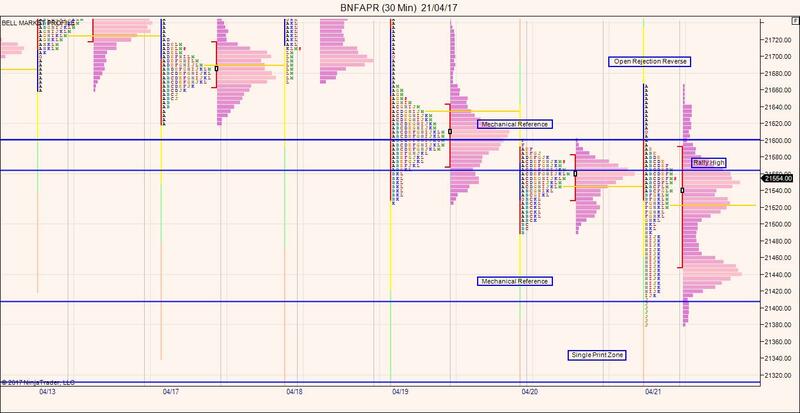 This week price looked above the recent short term balanced and failed. Fridays session is an outside bar and also price touched the bottom of the short term balance witnessed on the EOD chart. Fridays Session Bank Nifty Futures started with Open Rejection Reverse with an outside bar on the daily timeframe. However late rally is witnessed during the second half of the session. 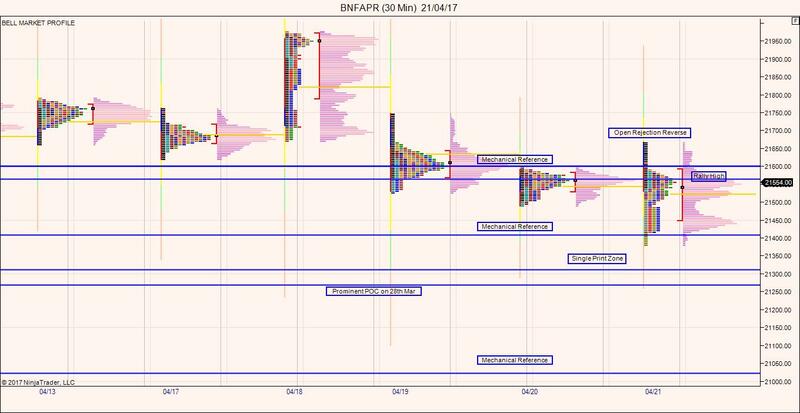 1) Price open around 21500 and this could bring one more day of value area overlapping with intial low confidence open. Rally High at 21564 remain the key reference acceptance above the reference could bring more higher activity and acceptance also shows the change in trade sentiment to positive. Failure to accept above rally high could bring more dull market. 2)Price opens above Rally High or a gap up scenario. This is a bullish sentiment ideally this brings high confidence and short covering in the market towards more higher price activity and can test even new highs.